The Saddleback Slug Caterpillar featured in the previous post now has troubles of its own. 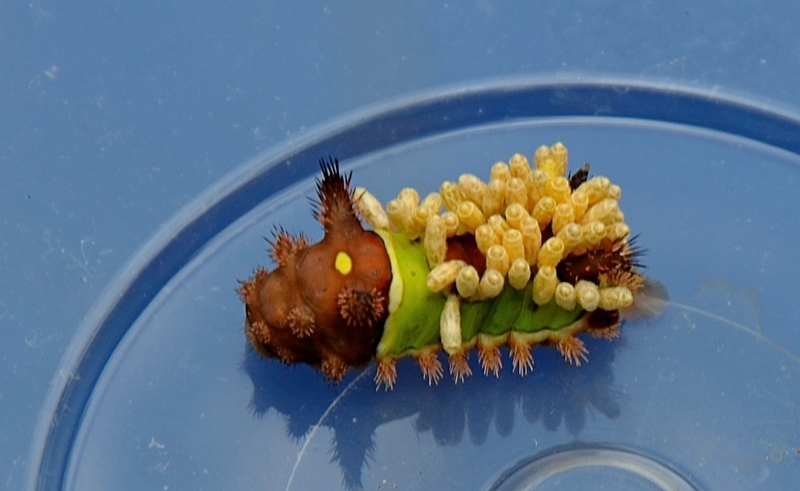 It was attacked by a female parasitic wasp which laid eggs on the caterpillar. The eggs hatched and ate the insides of the caterpillar. The eggs were present inside the caterpillar in the previous photographs, we just did not know it. The young parasitic wasps (in their pre adult form) have emerged as little oval cream colored pupae all over the back of the caterpillar. The pupae will hatch out and will have changed (undergo metamorphosis) into adult parasitic wasps and the cycle will start again. It is a rather gruesome sight that seems stranger than science fiction.